Sunday, September 9th is the 2nd annual Salem Road Race. This is a large race with over 2.400 registered runners. We anticipate significant traffic delays along the route during the race. NOTE: PARKING WILL BE PROHIBITED ON LAFAYETTE STREET BETWEEN DERBY STREET AND WEST AVE FROM 9:30 AM THROUGH 11:30 AM! 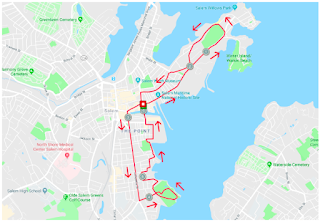 The race starts on Congress Street at 10:00 am (near the corner of Ward St). 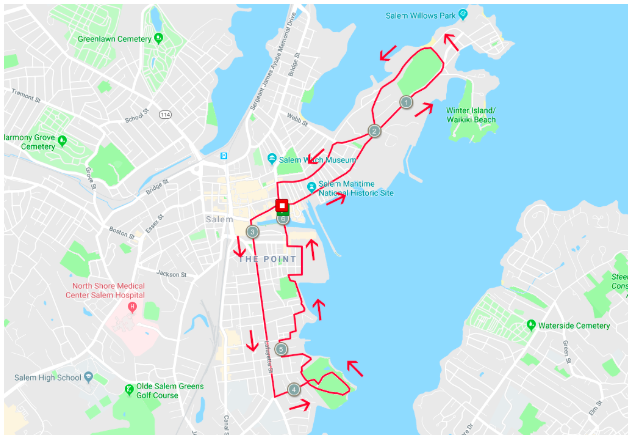 Runners proceed straight on Congress, right on Derby, straight on Fort Avenue, left on Memorial Drive, right on Fort Avenue, left on Essex, left on Hawthorne Blvd, right on Derby, left on Lafayette, left on West Ave, to Forest River Park pathway, right on Shore Ave to Ocean Ave, right on Summit Ave, right on Willow Ave, left on JM Walsh Square, right on Messervy St, left on Green, right on Leach, left on Lafayette Pl, right on Pioneer Terrace to Palmer Cove Park pathway, right on Leavitt, left on Pingree, left on Lynch, right on Congress to finish line on Congress near the corner of Pickering Way. We anticipate runners being off the road by 12:30 pm.